Suddenly it has turned cold at night and we can see the Pyrenees again. No snow yet but still sunny during the day. Couple of new paintings completed with four more started. Looking for more outlets to sell through and had a phone call from a contact who exhibits is several Retreats (old folks homes) and has had good sales. Another possibility is at the Palais du Beaumont in Pau - a very handsome building which houses a very good restaurant and the casino. 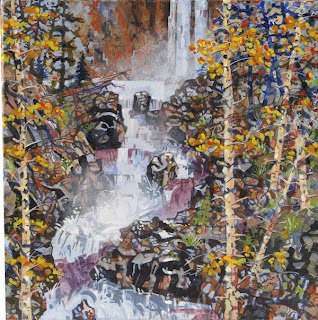 The painting above is based on the waterfall at the Cirque de Gavarnie south of Lourdes with a bit of artistic licence. Have started on a second of the main rock wall as I have decided to finally tackle the mountains.